Cyclin-dependent kinase 12 (CDK12) belongs to the cyclin-dependent kinase (CDK) family of serine/threonine protein kinases that regulate transcriptional and post-transcriptional processes, thereby modulating multiple cellular functions. Early studies characterised CDK12 as a transcriptional CDK that complexes with cyclin K to mediate gene transcription by phosphorylating RNA polymerase II. CDK12 has been demonstrated to specifically upregulate the expression of genes involved in response to DNA damage, stress and heat shock. 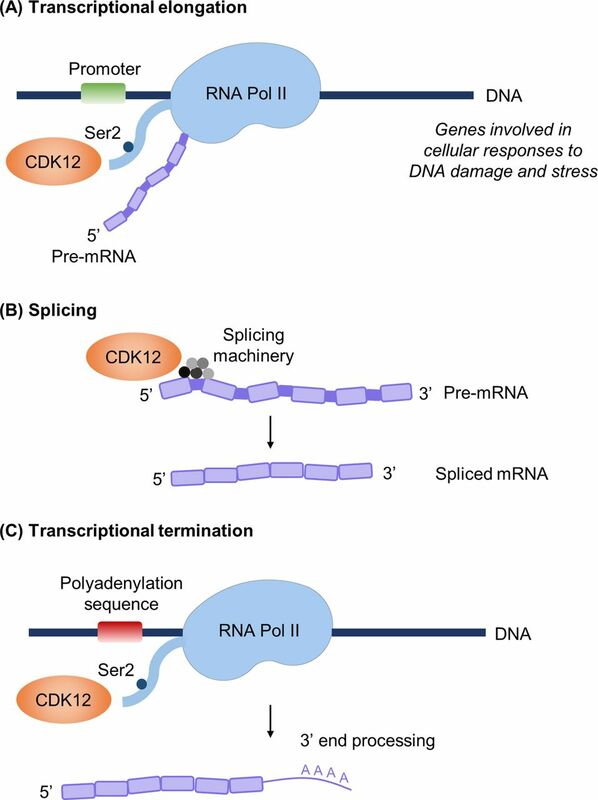 More recent studies have implicated CDK12 in regulating mRNA splicing, 3’ end processing, pre-replication complex assembly and genomic stability during embryonic development. Genomic alterations in CDK12 have been detected in oesophageal, stomach, breast, endometrial, uterine, ovarian, bladder, colorectal and pancreatic cancers, ranging from 5% to 15% of sequenced cases. An increasing number of studies point to CDK12 inhibition as an effective strategy to inhibit tumour growth, and synthetic lethal interactions have been described with MYC, EWS/FLI and PARP/CHK1 inhibition. Herein, we discuss the present literature on CDK12 in cell function and human cancer, highlighting important roles for CDK12 as a clinical biomarker for treatment response and potential as an effective therapeutic target. CDK12 (cyclin-dependent kinase 12; CRKRS, CRKR or CRK7) was first identified from cDNA screens for cell cycle regulators related to cdc2 kinases.1 In contrast to cyclin-dependent kinases (CDKs) that promote transition between different phases of the cell cycle, CDK12 is a transcriptional CDK with specific roles in regulating transcription of genes involved in cellular responses to DNA damage and stress.2–4 Emerging studies continue to dissect the role of CDK12 in cell function and cancer and have illuminated its potential clinical use as a biomarker and therapeutic target. Schematic structures of the CDK12 and CDK13 genes and chromosomal location of the respective genes. CDK, cyclin-dependent kinase; KD, kinase domain; PRM, proline-rich motifs; RS, arginine/serine rich motifs. Known functions of CDK12. (A) CDK12 phosphorylates RNA polymerase II (RNA Pol II) at Ser2, which promotes transcriptional elongation. (B) CDK12 interacts with RNA-processing factors to regulate splicing. (C) CDK12-mediated phosphorylation of RNA Pol II couples transcription and mRNA 3’ end processing. CDK12 reportedly regulates the expression of a distinct subset of genes, including those involved in the DNA damage response, cellular stress and heat shock. CDK, cyclin-dependent kinase. CDK12 expression is critical in mouse embryonic development. In vivo, Cdk12 activity was found to be critical from stage E3.5, and Cdk12 deficiency leads to arrest and embryonic lethality by stage E6.5.24 Cdk12 -/- embryos grown in vitro display spontaneous DNA damage and reduced expression of DNA damage response genes, including Atr, Brca1, Fanci and Fancd2.24 CDK12/13 and cyclin K are also required for self-renewal in embryonic stem cells, with knockdown of these proteins leading to differentiation.25 Roles in proper development of neural cells have been described, with mice expressing conditional deletion of Cdk12 in neural progenitor cells (NPCs) dying shortly after birth and exhibiting microcephaly. NPCs of these mutant mice also displayed lower expression of DDR genes, increased double-strand breaks and increased apoptosis.26 These findings recapitulate critical roles for CDK12 in maintaining genomic stability and expression of DDR genes in development. Analysis of the CDK12 gene across The Cancer Genome Atlas (TCGA) revealed mutations, amplifications or deep deletions in 30/32 tumour types (figure 3). 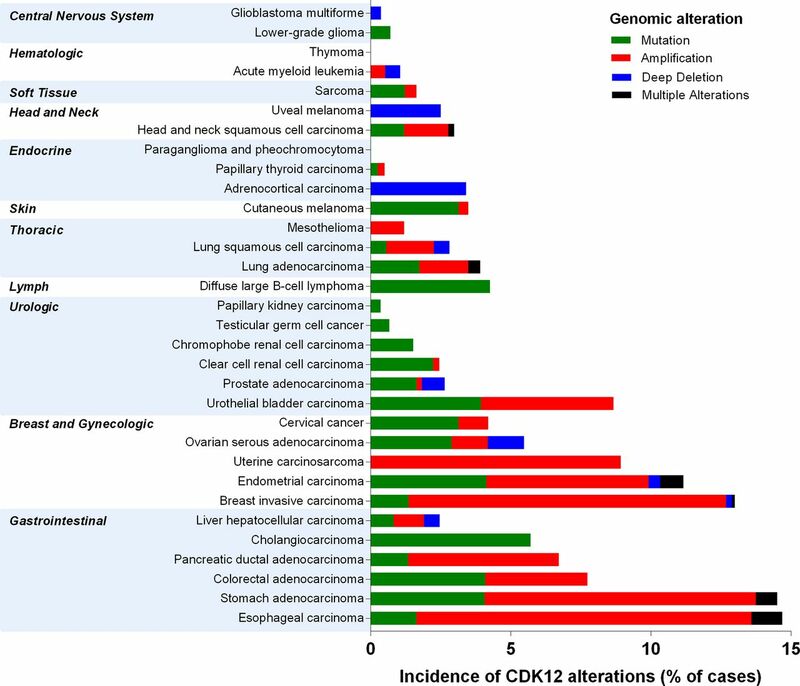 Tumour types with the highest percentage of cases with aberrant CDK12 (ranging from 5% to 15% of sequenced cases) include oesophageal, breast, endometrial, uterine and bladder carcinomas. Stomach, colorectal, pancreatic ductal and ovarian serous adenocarcinomas also feature significant levels of aberrations. Genomic alterations of the CDK12 gene across TCGA. Data downloaded from TCGA Provisional data sets on cBioportal (http://www.cbioportal.org/) in May 2018. CDK, cyclin-dependent kinase; TCGA, The Cancer Genome Atlas. The functional roles of CDK12 gene mutations, amplifications, deletions or variations in its expression remain incompletely understood, with both tumour-suppressive and tumorigenic roles proposed for CDK12. As far as its tumour-suppressive roles, two studies33 34 have reported that the majority of CDK12 mutations in high-grade serous ovarian carcinoma (HGSOC) are homozygous point mutations in the KD that abrogate the catalytic activity of CDK12. Loss-of-function of CDK12 results in decreased homologous recombination and enhanced sensitivity to DNA cross-linking agents and poly (ADP-ribose) polymerase (PARP) inhibitors. It is clear from these studies that the functional implications of CDK12 mutations are case-dependent and context-dependent. Continued elucidation of the specific roles of CDK12 will be important for its use as a biomarker to inform patient stratification for therapeutic intervention38 (figure 4). Potential for clinical use of CDK12 as a biomarker and/or therapeutic target. (A) CDK12 mutations that confer loss of function have been reported to promote genomic instability, rendering cancer cells more susceptible to PARP/CHK inhibitors. (B) On the other hand, CDK12 mutations that cause gain of function (eg, amplification) could theoretically potentiate cancer cell survival by promoting expression of DNA damage repair genes. Though there are currently few reports of this, such a situation would enable use of CDK12 as a biomarker of drug response/clinical outcome or as a drug target. (C) In cases where CDK12 is not necessarily mutated, CDK12 can enable tumour progression driven by genes such as MYC and EWS/FLI. These synthetic lethal interactions also provide an opportunity for therapeutic targeting. CDK, cyclin-dependent kinase. 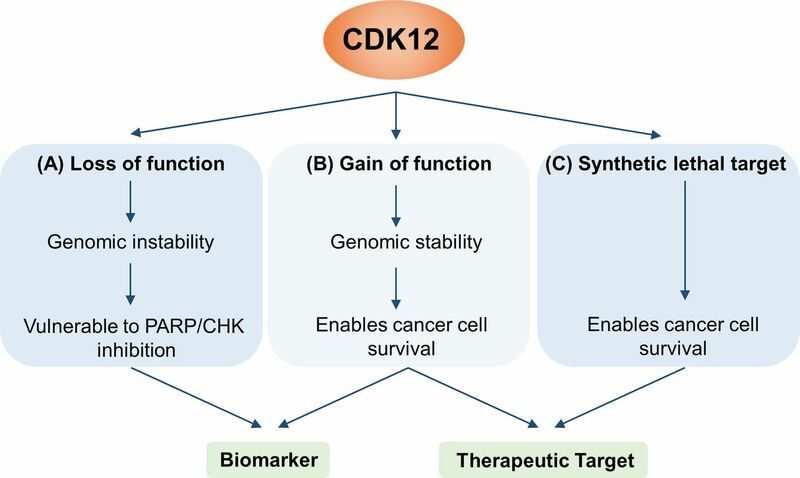 In addition to its potential role as a clinical biomarker, recent studies have highlighted CDK12 as a therapeutic target for cancer (figure 4). Inhibition of transcriptional CDKs could be an effective strategy to overcome resistance to targeted therapies, including erlotinib and crizotinib.46 Numerous other studies have identified specific genetic or cellular contexts that confer enhanced sensitivity to CDK12 inhibition, including MYC dependency, PARP inhibition and EWS/FLI rearrangement. Among the top genes identified as synthetic lethal with MYC were genes that regulate RNA polymerase II and cell cycle checkpoint control, including GTF2H4, POLR2E, RAD21 and WEE1.51 Additionally, deregulated MYC is known to induce replicative stress by accelerating the rate of DNA replication, pointing to replication-coupled DDR as a targetable weakness in MYC-driven tumours.52 53 The overlap between this MYC signature and the known cellular functions of CDK12 as well as the requirement of CDK12 for optimal processing of cMYC,21 collectively indicate CDK12 could be an effective therapeutic target for MYC-dependent cancers. Ewing sarcoma tumours are characterised by chromosomal rearrangements resulting in the fusion protein EWS/FLI, a potent transcriptional activator and transforming gene in this disease.57 A recent study reported that inhibition of CDK12 was specifically responsible for synthetic lethality in Ewing sarcoma cells with EWS/FLI rearrangement.58 Treatment of these cells with the specific CDK12/13 inhibitor, THZ531, preferentially repressed expression of DDR genes and was synergistic with PARP inhibitors. Interestingly, CDK12 is rarely mutated in Ewing sarcoma tumours (TCGA), suggesting that mutations in CDK12 are not necessary to confer its role as an effective therapeutic target. Tumours driven by oncogenes such as MYC and EWS/FLI are highly dependent on transcriptional programmes that converge on RNA Pol II59 60 and the need for DDR gene expression to facilitate rapid replication.61 Thus, impairing the function of CDK12 as both a transcriptional coactivator and specific regulator of DNA damage related proteins could explain the synthetic lethal interactions described above, representing a promising therapeutic strategy for these cancer types. Cyclin-dependent kinase 12 (CDK12) complexes with cyclin K to regulate transcriptional elongation, mRNA processing, proliferation and development. It regulates specific subsets of genes involved in cellular responses to stress, heat shock and DNA damage. Genomic alterations in CDK12 are frequently observed in human cancers. In high-grade serous ovarian carcinoma, HER2-positive breast cancer and lung adenocarcinoma, loss-of-function mutations have been reported, which decrease homologous recombination and enhance sensitivity to chemotherapy and PARP inhibitors. In contrast, CDK12 gene amplification could contribute to cancer fitness by constitutive engagement of DNA repair pathways. Synthetic lethal interactions have been reported for CDK12 with MYC, EWS/FLI and PARP inhibitors and have led to growing interest as a therapeutic target and biomarker for response in cancer treatment. The authors thank members of the Kemp laboratory for helpful discussions.
. CrkRS: a novel conserved Cdc2-related protein kinase that colocalises with SC35 speckles. J Cell Sci 2001;114(Pt 14):2591–603.
. SH3 domains: complexity in moderation. J Cell Sci 2001;114(Pt 7):1253–63. Contributors GYLL wrote the manuscript and prepared all figures. CG and CJK contributed to writing of the manuscript. Funding GYLL is funded by the Ovarian Cancer Research Fund Alliance. CJK is funded by grants from the NIH/NCI (U01 CA217883, U54 CA132381). Competing interests CG and CJK are cofounders of and have ownership interests in SEngine Precision Medicine. GYLL has no competing interests to declare.